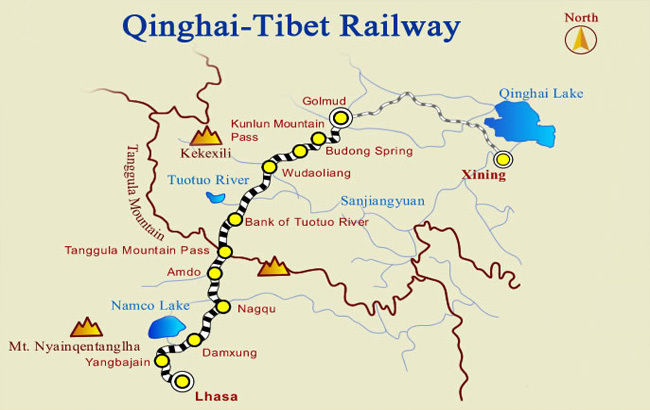 Qinghai-Tibet Railway, The world’s highest railway, with the alternative name “rocket to the roof of the world”, on which the train to Tibet get started from mainland China, makes your trip to Tibet extremely unparalleled and attractive to international travelers. 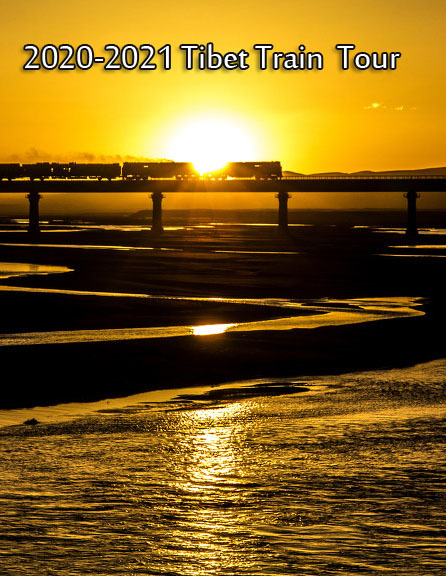 Starting from Xining, the Qinghai-Tibet train ushers the first superb view to passengers at Golmud, also known as a rising city of the gobi desert, where Qarhan Salt Lake, the largest salt lake in China lies. Tourists can see endless grotesquely-shaped salt flowers ans unusual salt lake surroundings. 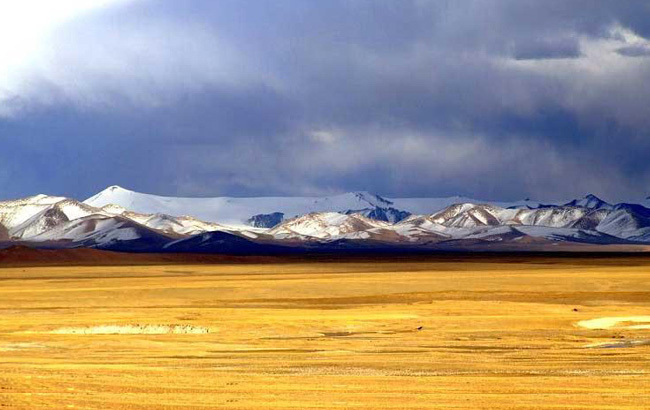 A glimpse of stunning vista of Gobi Desert in Golmud in fall. Qarhan Salt Lake, 750 kilometers away from Xining, might be the first majestic sight that catch your attention when you are on the train to Lhasa for 32 kilometers of the Qinghai Tibet Railway. 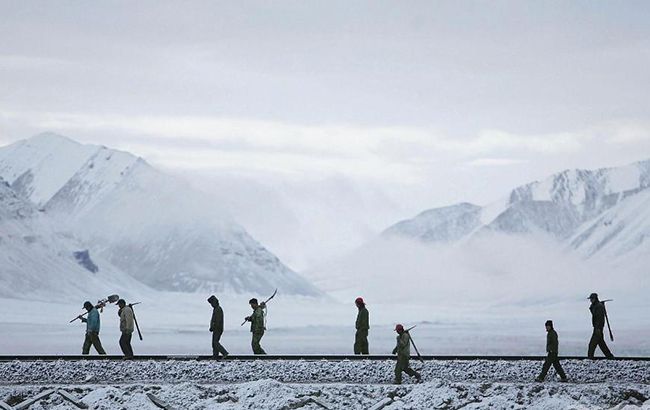 As the train keeps moving up, it will stop at station of Yuzhu Peak at an altitude of 4160m. The Yuzhu Peak is the best mountain for entry-level mountaineering. If weather permits, one can have a clear view of the summit of Yuzhu Peak. Yuzhu peak has an altitude of 6178m and is the summit of east part of Mt. Kunlun. Its topographical feature is ideal for entry-level mountaineers for its wind-eroded rock face of mountain and gentle slope cause no avalanche. With a varied topography, for years it has remained a popular destination for mountaineering training. Shortly passing Yuzhu Peak, the trains enter the well-renown Kekexili nature reserve, the least populated and isolated region in the northwestern part of the Qinghai-Tibet Plateau in China. It is home to many wildlife such as Tibetan antelope, wild yak, wild Tibetan donkey, etc. Then, the train will arrive at the station of Tuotuo He River, where tourists can enjoy natural scenery and cultural heritage of Tuotuo River, the first town of away from the source of Yangtze River. In May each year, the pregnant Tibetan antelope will migrant to Kekexili Nature Reserve to deliver baby antelope. The tunnel is built under the bridge to allow Tibetan antelope to have an easy access. With an altitude of 4533m, Tuotuo River enjoys a comparatively mild climate in the region of the source of Yangtze River and is the place with the lowest altitude between Kunlun mountain pass and Tangula pass. 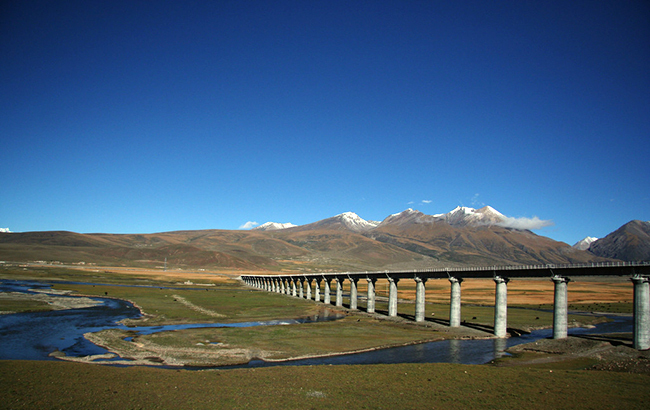 Then, the train heads for the highest place of Qinghai-Tibet Railway, which is the Tanggula station (5072m). Having a ride at such a high altitude makes passengers truly feel how marvellous the “Sky Road” is. The Qinghai-Tibet train is heading towards Tanggula Mountain and the phenomenal mountainous range will definitely blow you away. After entering the Nagqu prefecture, the train unfolds a completely different natural beauty to riders. Tourists can catch a glimpse of Tsonag Lake, one of the highest fresh water lakes in China, which is only tens of meters away from the railway. The lake looks like a precious mirror and meanwhile travellers can enjoy the boundless Qiangtang prairie, one of the top five pastures in north Tibet plateau as well as home to numerous rare wildlife. Tsonag Lake has an altitude of 4650m and is an alpine fresh water lake, covering an area of over 400 km. It is believed to be a sacred lake by local Tibetans and thousands of Tibetan pilgrims come to here and worship the lake for auspicious year. The train will stop here and tourists can take a snapshot themselves. If you are interested in Tibetan prairie or Tibetan nomads, then Qiangtang prairie is the place where you should be. The boundless grassland and century-old nomadic life offers tourists many more to explore. You can see nomads and their livestocks in summer along the railroad in Naque. The next highlight comes at Damxung railway station, a midway between Nagqu prefecture and Lhasa. The sacred Namtso, dazzling like a crystal-clear gem, is the second-largest saltwater lake lying in Qiangtang prairie in China. It is only 30 km away from Damxung county. The surrealistic scenery of Namtso Lake is one of the major tourist attractions in Tibet. In the Tibetan language, “Namtso Lake” means “Heavenly Lake”. Each year, numerous Tibetan pilgrims and tourists will come and do the circuit around the sacred lake. Lhasa, the final destination of Qinghai-Tibet train, offers virtually every aspect of Tibetan culture for visitors to explore.